AN explosion and fire has hit Valero Energy’s 225,000 bbl/d Texas City refinery, with no injuries reported. The explosion on Thursday is thought to have occurred at the site’s 12,000 bbl/d alkylation unit, Reuters reports. It was reportedly heard 8km away and shook buildings within 1.6 km of the plant. As the incident unfolded, staff at the Valero facility and Marathon Oil’s neighbouring refinery were told to shelter in place. The fire was contained about an hour and half after it broke out. Texas City has been home to a series of tragic industrial accidents. In 1947, a ship carrying more than 2000 t of ammonium nitrate blew up in the Port of Texas City killing 581 people. 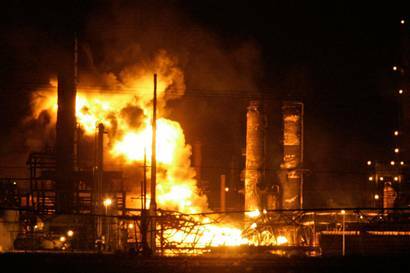 In 2005, an explosion at BP’s Texas City refinery – now owned by Marathon Oil – killed 15 workers and injured 180 others.